Karbonn is doing great work with their mobile phones. The Titanium series of Karbonn are just amazing! 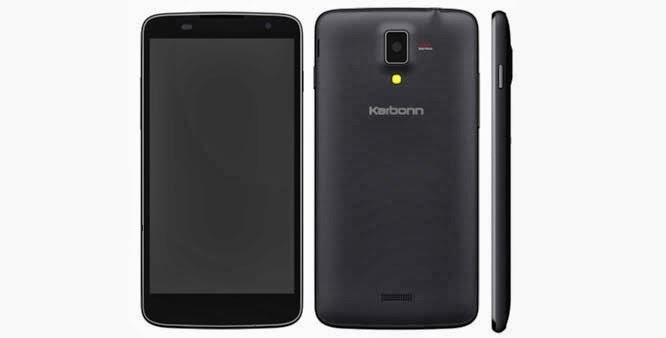 Karbonn Titanium S5, Karbonn Titanium S1, all are amazing. Because of this, Karbonn stands on 4th position of best mobile makers in India! Karbonn are launching superb Android mobile phones and are getting good reputation in Indian market. The Device, I'll be showing you today is Karbonn Titanium S5+ (Plus). First of all, let me clear that this device is a competitor not a competitor of Micromax A250 Turbo! You can compare it with Canvas Magus, Canvas HD, Canvas A210 Canvas 4 and other Micromax devices because it's specifications are not that much good as expected but the price amount is expected totally unexpected! We expected it will be more than 15 thousands but we found that it is just 11 thousands. The device is having new MediaTek MT chipset which is MediaTek MT6582, I don't know much about this chipset but some basic things of it. The super device is having 5 inch qHD IPS Display with a resolution of 960x540 and that's not actually great. You get Dual SIM support with Dual SIM standby in this device. Another thing which is not good about this device is Android 4.2 Jellybean. Has Karbonn released any device which has Android 4.3? NO! Has they provided any 4.3 JB update for their devices? NO! I mean why don't they release devices having 4.3 or 4.4 KitKat? Okay, the RAM is good and the storage is also good. The processor seems to be interesting. I opened MediaTek's official website and found that there were no any chipset like MT6582! I think it's a mistake by MediaTek that they has not updated their website anyway, I won't comment on it because I don't know this chipset. But it is 1.3 GHz so I think it's elder brother of MediaTek MT6572 because even it was 1.3 GHz. The only difference is that one is Dual Core and second is Quad Core. Mali 400 is a good GPU which has been pushed to S5+. There will be no issues in graphics because of this chipset. Camera is also impressive. 8 Mega Pixels is good but 0.3 Mega Pixels is very bad. No quality at all. Other things are good like 3G, WiFi, Bluetooth etc. Now, I will tell you my reviews upon its Gaming, Multitasking, Storage and battery backup. Let's see the gaming review of this device first. After seeing the specifications of this device, I think you can run HD Games like Temple Run 2, Temple Run: Oz, Need For Speed: Most Wanted, Fifa 13, Subway Surfers etc. because all the games work in devices with 512 MB RAM and 1/1.3 GHz Dual Core processor and because this device is having 1.3 GHz Quad Core processor and 1 GB of RAM, I think it can easily pickup these games and run them without lags. Multitasking is a common feature of all the Android devices. You cannot can run many light heavy application side by side and switch between them easily them because there is enough RAM to handle all those applications easily. You can run heavy applications like FxGuru, Office Pro, Focal etc. easily without lags and switch between them easily. You get 4 GB of internal memory with this device and which is enough for normal users (not superusers!) but for gamers, it is too less! Most of the games cover more than 1 GB of storage and no gamer has only 1 or 2 games! They've and play more than 5-6 games so the storage is less for them, anyway, but it is not too less. Most of the devices has 4 GB only. The battery backup is amazing not too good and not too bad. 1800 mAh battery is good but what about for the people who mainly uses their device for playing games, using internet, calling? If we see by the eyes of them then we will find that battery is actually too less. 2000 mAh battery should be must, even for a normal user. Hope you liked the review. Did you have this device? Give us your reviews! i m not able to move games from internal to sd card?